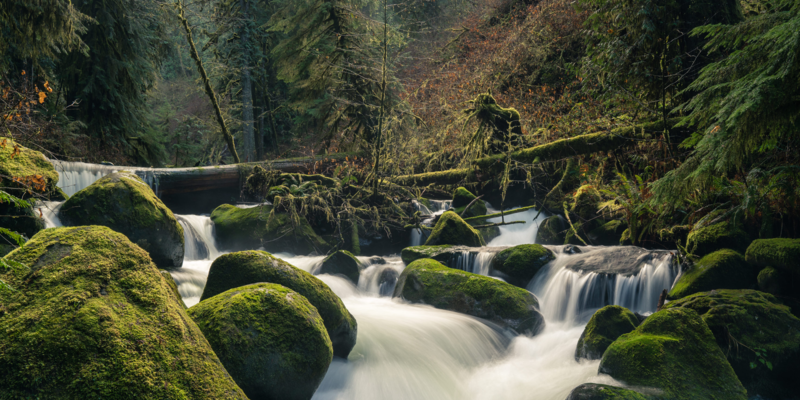 The waterfalls, streams and creeks scattered throughout the Columbia River Gorge in Oregon. Before moving to Portland, I never photographed landscape scenes, focusing exclusively on urban and architectural subjects. 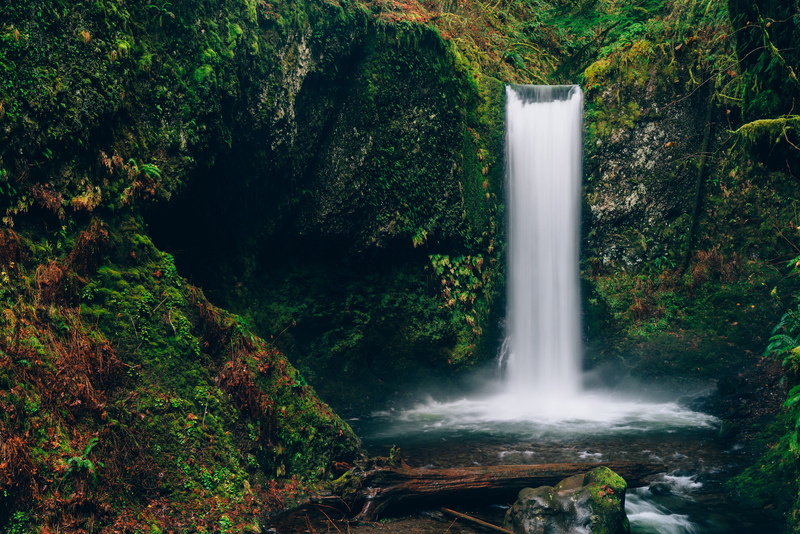 When I stood in front of my first waterfall (shortly before moving to Portland), I instantly fell in love with the grandeur and beauty of this particular type of nature. 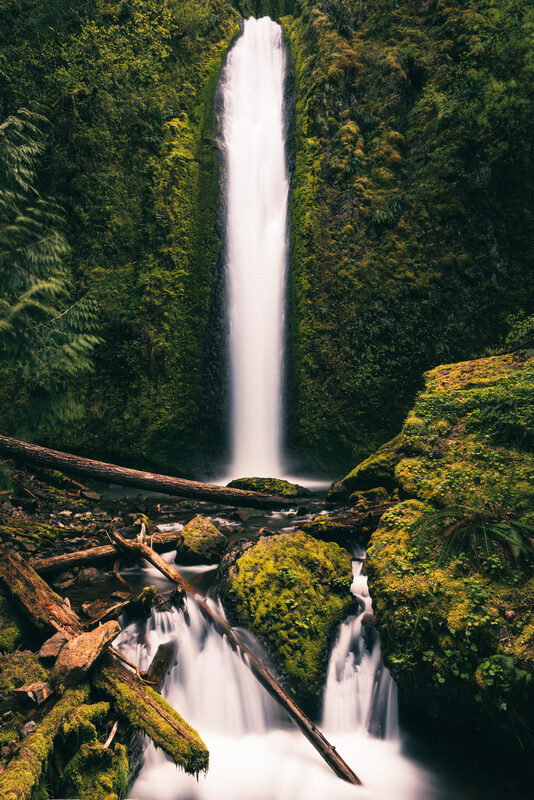 Tourists typically visit Portland and the Columbia River Gorge (which is a short 30-40-minute drive outside of the city) during the late Spring and Summer months. During this time the overcast, grey, and rainy skies that we’re most known for go away and leave us with an insanely lush and verdant forested landscape. However, while the weather may be agreeable, it also results in throngs of people overcrowding these areas, often making it extremely difficult to get to your intended destination. I prefer visiting the Gorge area during the Autumn and Winter months, during the week, and while it’s raining. Aside from the great reduction in tourists, I find that the overcast skies allow me to really bring out the greens of the lichen and surrounding trees, especially when using a circular polarizer. Another bonus of having overcast skies is that I don’t have to worry about hard shadows or overly bright sunlight because it’s diffused and soft. If you’re flying in, you’ll want to select PDX (Portland International Airport) as your airport. It’s my favorite airport of any I’ve flown through. From the airport, you can reach the entrance of the Gorge in about 45 minutes by taking I-84 eastbound towards Troutdale. I’m a big fan of Ruckel Creek Falls. It’s not the most famous or largest waterfall in the area but it offers a wonderful variety of subjects to photograph and the trail leading away from the upper falls offers up a fabulous hike. One of the great things about the waterfalls within the Columbia River Gorge is the variety of reachable destinations offered to visitors. Some waterfalls are located within a stone’s throw—literally—from the paved parking area. Other waterfalls require a mild-to-moderate hike. Finally, there are waterfalls that take several hours to hike to and require you to be in moderate-to-good shape. Regardless, you’ll want to wear good hiking shoes and pack layers as the air tends to cool off the closer you approach the falls. You’ll also want to pack a few microfiber cloths because your lens will definitely get coated with spray the closer you get. 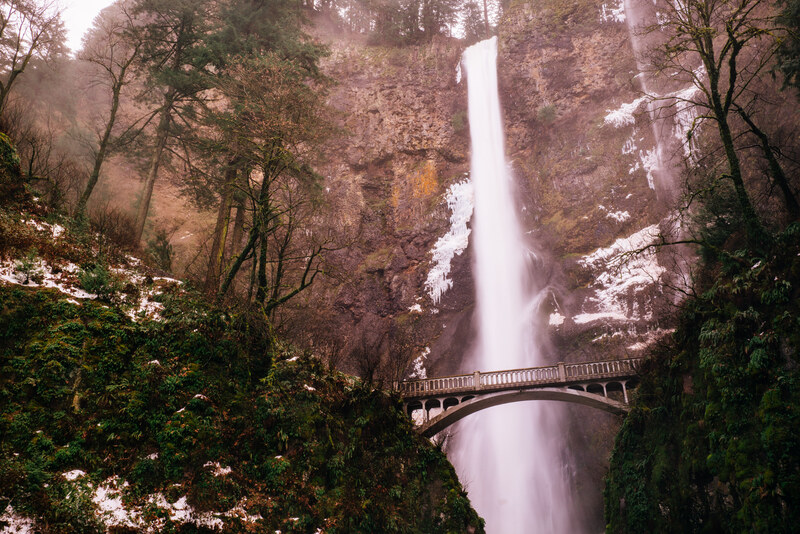 The most popular attraction by far is Multnomah Falls. In addition to being celebrated as Oregon’s tallest waterfall, it is also adorned with the very picturesque Benson Footbridge. 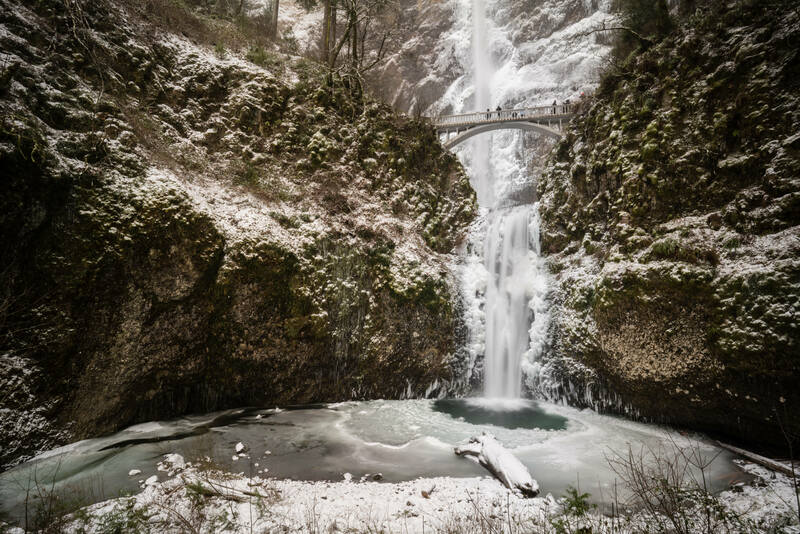 Multnomah Falls has the largest parking area in the Gorge but if you plan on visiting during the weekend and/or when the weather is nice, prepare for a massive wait to park. You’ll also be joined by tons of other tourists, so keep in mind that maneuvering with your camera and tripod may be challenging. Still, if you have never seen this waterfall, I highly recommend you carve some time to visit it. There are many waterfalls in the area that are fairly accessible and offer paved paths for wheelchair access. With that said, keep in mind that these paths may be at an incline or decline, so some effort will be required. Other waterfalls will require hiking to get to and the distance can range dramatically depending on the destination. If you’ve gotten your fill of photography (that’s not really possible, is it? ), you can choose to partake in some of Oregon’s famous microbreweries, artisanal coffee roasters and its charming wine region. Additionally, Portland is renowned for its food culture, so I strongly recommend exploring the plethora of fabulous restaurants in the area. I’m a huge fan of Dove Vivi pizza in NE Portland and Bamboo Sushi in SE Portland. 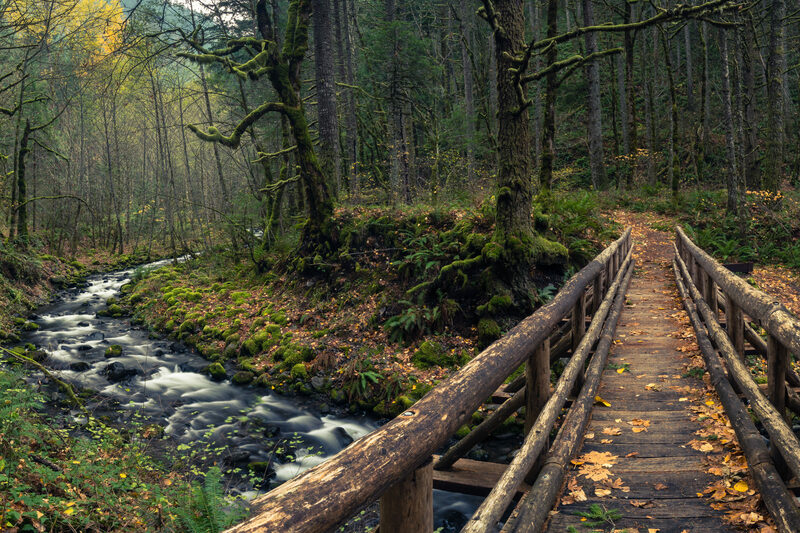 It’s no coincidence that Oregon’s state abbreviation, OR, is found in the word “Explore.” While visiting this magical place, keep your mind open and allow yourself to discover new things. Before visiting Oregon for the first time, I never thought I’d be into landscape photography. I had never camped a day in my life. Now, I don’t know what I’d do without it. Brian is a professional photographer, published author and educator who specializes in landscape and travel photography. While he grew up enamored with photographing the amazing architecture and street life of New York City, his hometown, he now finds himself pointing the business end of his lens at waterfalls, wide-open vistas, and rocky landscapes. Words and images ©2017 Brian Matiash. All rights reserved. Great article Brian! I visited your neck of the woods for the first time in early-May and it easily exceeded my expectations. I had clear blue skies all week, which meant that I had to get up early to catch the sunrise and photograph the falls I wanted before the light got too harsh…but that also meant front row parking to all the major trailheads (including Multnomah!). I can’t wait to visit the Portland area again and check out more trails. Thank you for reminding me of how kick a** the Gorge is! I can’t say enough about my recent trips to Portland to visit my son, who is part of the crew for the Portlandia show. The gorge is easy to get to being only about 1/2 hour from downtown Portland (unless you are trying to get there during rush hour). Love the hiking (if it is not too challenging), the craft beer, food and Powell’s, the world largest bookstore. The town is one of my favorite to visit. As a resident of Portland I agree with all that has been said about the Columbia River Gorge, it’s an amazing and beautiful place. It’s also been badly burned by wildfire in the last couple weeks and is largely closed to all but fire crews for the foreseeable future. This is truly sad, but I feel confident over time the area will recover. There is no shortage of water to help the green return. Be sure to check before you visit.